When a job gives you satisfaction, when a job completes your existence, when you feel good after a day’s work that you leave with your heart full and a smile on your face….that is passion. It is a feeling that stems from deep inside, a fire that that brightens up my day. This is how I feel about social work!!!! Let me explain…. It is not the organization one works in that determines one’s passion. It is about the nature of the job and the force applied to the tasks at hand. In social work for me it is being blessed enough to get the opportunity to step into other people’s lives and being trusted to make a positive change. This is a big deal. No one wants people poking their noses into their business but as a social worker your “poking” is sought out. Social work gives me the chance to love and accept individuals as they are; with their weaknesses and to be able to celebrate with them their strengths. It allows me to see a person as a whole, all facets of their life and see what makes them tick or not. In particular residential social work allows me more than a glimpse of the day to day development of my clients and this is very fulfilling. I am lucky to have found my love and my niche after four years of social work. Working with children who think they know it all, teenagers who are wannabe adults and those children who actually don’t have a clue and need guidance all the way. I feel blessed to have a chance to work with all kinds of behavior problems in children before I even have my own kids, oh yes it is practice. I love challenges and every day I feel I have survived and made a difference, so it is a growth opportunity for me. In life one needs something that they feel passionate about. Without it something dies within us, our ability and creativity dies. We all need something that motivates us to get out bed in the morning. The kids I work with are my joy and I love spending my days with them. Work becomes a joy and a learning experience not a chore if you are passionate about what you do. 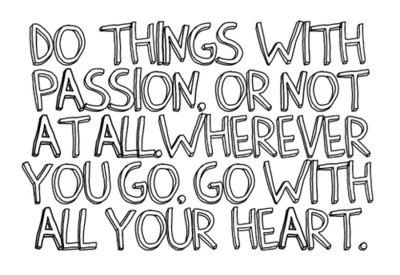 This is what everyone needs and I urge everyone to not give up on looking for their passion in life. Seek that something that completes you and life has a purpose.